Healthcare. Education. Hunger. Poverty. We can use AI to solve these global problems. 3 billion people live on less than $2.50 a day. Around half of our world’s population does not have access to essential health services, such as surgical care, medicine, and proper facilities. Over 1 billion people do not have access to electricity. 72 million children do not have access to education, and over 750 million adults are not educated. In developed countries, 700 million people have access to a good lifestyle, in terms of everything from the environment, to energy, to housing, to healthcare, to education, to food and water. We have also created some amazing technologies that we have available at our fingertips, and we can use this to help people in developing countries. Artificial intelligence is a technology that has been greatly incorporated in our day-to-day life, like recommendations from Netflix and Amazon, weather forecasts, voice recognition services such as Siri and Alexa, and much more. But we can also use this technology to create a huge impact and help billions of people around the world. We can use AI to go through massive amounts of data and identify diseases and genes. AI can be used to examine data and detect patterns. One example of this is with malaria detection. Doctors have to count each individual malaria parasite in the patient's blood to diagnose the patient properly. Thanks to AI, we can now do this diagnosis using computer vision, which is a branch of AI that allows computers to see and understand images. This is a huge problem in certain developing countries, as malaria is a huge risk there, and with this technology, we can speed up the process of diagnosing and treating patients. We can also use AI to go through genetic data. IBM Watson was able to identify new genes linked to ALS by looking through a lot of research and data about this. AI can also be used to predict which patients would benefit from using a particular drug. Based on a person’s genes, we can use AI to detect whether or not specific drugs would work for them. This would be a highly personalized approach and save time and money. We can use AI to have a positive impact on education levels in poor areas. We can use AI in certain areas where students do not have access to facilities or teachers. Chatbots can be used to guide students, real-time, through a syllabus, and assess the learning level and skills of individual students. As long as there is access to internet connection, this method could be used. This could entirely eradicate the money and facility barrier so that many more people get access to an education. AI can also be used for tailored learning. Rather than the current methods of just one form of learning, we could personalize learning to each student, depending on whether they learn better through listening, visualizing, or doing things hands-on. This will allow students to get a better quality of education that is tailored to them. We can use AI to improve the sustainability of food crops. AI can be used to improve agriculture, which is a huge source of income for many people in developing countries, as well as the main source of food. We can use AI and robotics to analyze the best way to optimize the growth of crops. We can also use AI to monitor crop and soil health. Computer vision and drones can be used to detect whether or not a plant needs more watering, is growing properly, or is ready to harvest. By using this technology, we can drastically increase the yield of crops, which means more income and food for people in developing areas. Health, Education, Food, and Income, are huge factors in poverty. 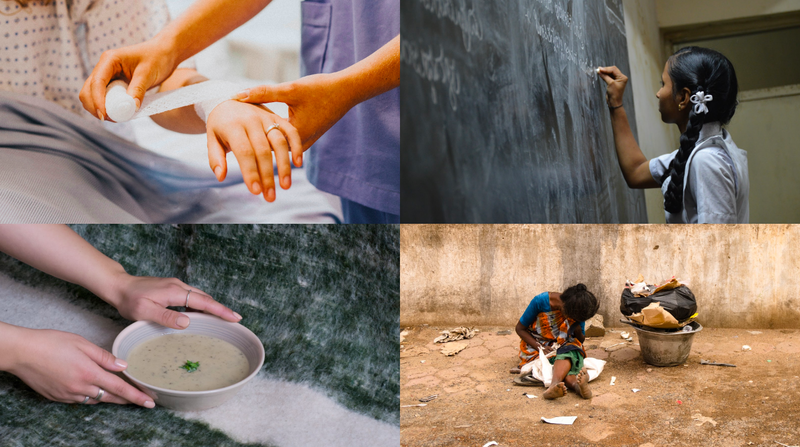 By using artificial intelligence to improve the main causes of poverty — healthcare, education, food, and income — we can improve the lives of people who are in poverty and help them develop more. I am very passionate about AI, and have been building machine learning projects and been working with companies like Microsoft, Google, and Walmart on some of their machine learning problems. I really believe that we can use this technology to disrupt every industry and help improve the lives of people around the world. Take a look at my website (zaynahbhanji.com) to view some of my machine learning projects and talks! Follow my LinkedIn and Medium to keep updated with my progress in AI! Check out my personal website (zaynahbhanji.com) to view my projects, talks, media, and more!